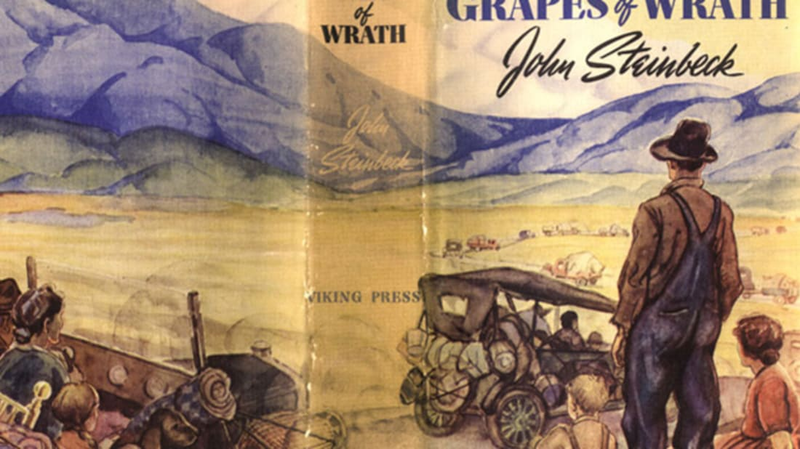 The Grapes of Wrath is John Steinbeck’s award-winning political novel about the Great Depression. It follows the Joad family as they’re forced to leave their Oklahoma farm and go west to California for work. The 1939 book humanized the “Okies,” captured history as it was happening, and earned its author so much personal trouble that he started carrying a gun for protection. Find out more about the classic below. 1. THE NOVEL WAS INSPIRED BY VISITS TO LABOR CAMPS. In 1936, the San Francisco News hired Steinbeck to write a series of articles about migrant labor camps in California. The articles, which you can read here, were later reprinted in a pamphlet along with Dorothea Lange’s iconic photographs. In the pieces, Steinbeck described Americans living in filthy shacks without running water and suffering from malnutrition, illness, and death. He used much of what he saw in The Grapes of Wrath. 2. STEINBECK INADVERTENTLY USED RESEARCH FOR SOMEONE ELSE'S NOVEL. The author dedicated The Grapes of Wrath to Tom Collins, who managed the Migratory Labor Camp in Kern County, California and helped Steinbeck research the novel. "I need this stuff,” Steinbeck wrote of the detailed reports Collins gave him about the camps. “It is exact and just the thing that will be used against me if I'm wrong.” But Steinbeck didn’t know that another writer, Sanora Babb, had written the reports and was using them as the foundation for her own novel, Whose Names Are Unknown. It was going to be published by Random House when The Grapes Of Wrath hit the bestseller list. Steinbeck’s novel upstaged Babb and her book was shelved until she finally published her work in 2004, the year before she died. 3. WHILE HE WAS RESEARCHING THE WORK, THERE WAS A RIOT IN STEINBECK'S HOMETOWN. 4. STEINBECK FOUND WRITING THE NOVEL HARROWING. While writing The Grapes of Wrath, Steinbeck kept a journal of his process. The account shows the emotional ups and downs of an intense writing experience. He knew he was writing something that could be potentially great, but he doubted his ability to do it. “This book has become a misery to me because of my inadequacy,” the journal reads. He seemed to find writing not only mentally difficult, but hard on the nerves. “My stomach and my nerves are screaming merry hell in protest against the inroads,” he wrote. And again later, “And now home with a little stomach ache that doesn’t come from the stomach.” For more, here's a podcast of an actor reading from the journal. Steinbeck’s wife Carol thought of taking The Grapes of Wrath from "The Battle Hymn of the Republic": “Mine eyes have seen the glory of the coming of the Lord/He is trampling out the vintage where the grapes of wrath are stored.” The poem—later a song—was written by Julia Ward Howe in 1861. She got “grapes of wrath” from Revelation 14:19 in the Bible. In choosing the title, Steinbeck was emphasizing that the book was American, not Communist propaganda, as he knew it would be called. 6. THE BOOK WAS BURNED AND BANNED. The novel was critically acclaimed and a bestseller—some 430,000 copies had been printed by February 1940. But it was also controversial. The Associated Farmers of California was angered by the book, which implied that they used the migrants for cheap labor. They called the book a “pack of lies” and launched an attack against it, publicly burning the work and calling it Communist. Other institutions banned the book because of profanity and because of the ending, when a woman breastfeeds a starving man. 7. STEINBECK GREW SO AFRAID THAT HE STARTED CARRYING A GUN. 8. THE 1940 MOVIE VERSION WAS A BOX-OFFICE SMASH. While the book did well on its own, the 1940 movie cemented The Grapes of Wrath as a classic. Directed by John Ford, it starred Henry Fonda as Tom Joad. Steinbeck reportedly liked Fonda’s performance, saying it made him “believe my own words.” Ford won an Oscar for Best Director and Jane Darwell won Best Supporting Actress as Ma Joad. 9. WOODY GUTHRIE WROTE THE BALLAD OF TOM JOAD. 10. THE GRAPES OF WRATH GAVE ROUTE 66 ITS NICKNAME. In the book, Steinbeck writes about Route 66, the 2,500-mile-road between Chicago and Los Angeles, which used to be a major artery in the United States. “66 is the mother road, the road of flight,” Steinbeck penned. Since then, the "Mother Road" has been portrayed in everything from Bobby Troup's song "Route 66" to Jack Kerouac’s novel On The Road. 11. THE NOVEL LED STEINBECK TO THE NOBEL PRIZE. The Grapes of Wrath won the 1940 Pulitzer Prize in Fiction and was a major factor for Steinbeck winning the Nobel Prize in 1962. Here’s his Nobel Prize acceptance speech.